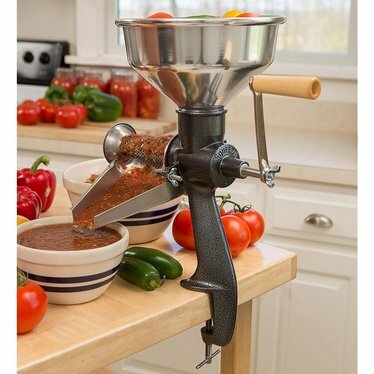 If you can or freeze a lot of garden produce, this mill is well worth the investment. The design was brought to America by an Italian immigrant in the early 20th century. The quality and versatility of the Squeezo are still celebrated today. Note: Shown with optional pumpkin/salsa screen. Sold separately. The Squeezo food mill separates seeds and skins from the pulp of soft fruits and vegetables by simply turning the handle. Comes with a plunger to help push food through the hopper. No electricity needed. Standard tomato screen (1/16" holes) is great for making sauces. Purchase our optional screens so you can make more foods, like salsa, pumpkin puree, jams and jellies. Each sold separately (see related products). I have canned from 100-265 jars of goodies each year and I tried this for the first time yesterday with some fresh roma tomatoes to make pizza sauce and it is awesome. The squeeze is so easy to set up and use, but cleaning the tomato screen afterward can be tricky. I had a hard time getting the small pieces of tomato skins out of the bottom (narrow) part of the funnel screen. I had to use a tooth brush and tweezers to get the small pieces out. Even with this small issue I am still giving it five stars because it is so simple to use and set up and the results are amazing. Glad I ordered the pumpkin screen too. It may seem expensive, but I wish I had bought it 6 years ago, it would have saved a lot of time and frustration in my canning process, and it will last me a very long time. I have a question...Can I put a motor on this? Lehman's says: Sorry, no motor is available for the Squeezo. My mother had one of these and she loved it! My tomatoes are just starting to ripen. Can't wait to try it out. I am also planning on using it to make pear sauce. This should make the job a lot easier! Have had mine for close to 40 years. I make jelly, applesauce, tomato sauce and juice every year. Have only replaced the rubber gasket once. Friends and family have borrowed it many times to make sauce. I freeze my tomatoes, until I have several gallons. I then thaw them and run them through my Squeezo. I can't imagine doing sauce any other way. I had been using a 30 year old similar strainer till I received this one. At first, I was frustrated with the fact that I had to run everything through it 3 times. But in the end I realized it made my sauce SO much thicker! What have I been missing these years with the other one I was using? 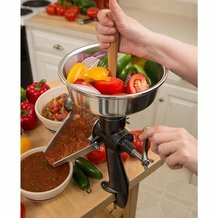 I love using this to make tomato juice, sauce, and applesauce. This product seems SO sturdy I should be able to use it for a very long time. Set up is pretty easy. As long as you are careful with pushing food through the hopper no leaks! Great product, wish I had gotten one sooner! Ours too is over 40 years old and works as well as the day my father purchased it. This handy tool is well worth its money. Squeezo is so great the foul ex and his inbred sisters stole mine during the divorce--this machine can make some great tomato puree which can go on to be sauce, catsup, taco sauce, whatever! If you can keep inbreds from stealing yours, you can probably use the same Squeezo your whole life--it's durable and well-made for the long haul. Have used my Grandma's meat grinders and Foley setup. I found this easy to operate, easy to use, and easy to clean up!! I have had my Squeezo for over 40 years and came to Lehman's where I found new rubber rings to purchase. Best product ever with no staining because of the metal construction. My rings I cut out myself from material from a hardware store worked but I am extremely glad to find real replacement ones! Italian family who began originally making the Squeezo had their factory burn down years and years ago so I was thrilled to find Lehmans somehow carrying the Squeezo again. Great for applesauce and tomatoe pur�e to can. My gardening friends are thrilled to find out where to purchase this original. Thanks Lehmans! go ahead and giggle at the name; we do each year we pull the Squeezo out for canning. There's little effort required to turn the crank. The clamp does handle all the wear and tear we give it; the screen does an incredible job of sorting. Cleaning the screen can be tedious - the brush does wonders. I've had mine for more than 25 years -- my children and their friends have learned to appreciate fresh produce because of it!